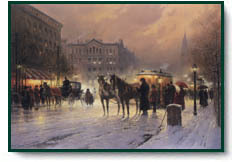 Horse Trolley on Park Row by G. Harvey depicts horse and carriages on a snowy evening in the city. This print was issued & released in 1991. Horse Trolley on Park Row copyright© 1991 by G. Harvey is prohibited from being copied.